Mona Louise Parsons was born in Middleton, Nova Scotia in 1901. As a young woman, Parsons moved to New York City in 1929 to pursue an acting career and later became a nurse. When she was 36, her brother introduced her to millionaire Dutch businessman Willem Leonhardt. The couple married and settled in the Netherlands in 1937. In May 1940, Holland was invaded by Germany. The country was plunged into an occupation that would drag on for five years, resulting in the deaths of thousands of its citizens, and bringing the nation to the brink of starvation. Though Mona was a wealthy socialite, she believed it was necessary to find ways to resist the occupation. She and Willem joined a group of like-minded people who vowed to do whatever they could to counter the Nazis’ efforts. Parsons was truly a woman of dignity and courage—qualities that proved invaluable when she and her husband joined a resistance unit. Parsons and her husband began sheltering downed Allied airmen in their estate called “Ingleside” near Laren, after having dismissed their servants so that their rooms could be used to hide these men. A special refuge behind a bedroom closet could also be used in case the home was searched. Upon leaving, fishing boats took the airmen to meet up with British submarines for their escape to England. Unfortunately, an informer reported them to the Gestapo and Parsons was arrested on September 29, 1941. She was taken to prison and at her trial on December 22, 1941, she was found guilty of treason and given a death sentence. She responded with such dignity that the judge allowed her to appeal her sentence which was then converted to life in prison at hard labour. While serving her sentence, she met a young Dutch baroness and the two women made plans to escape. In March 1945, the prison was bombed, giving them their opportunity. The women disguised themselves by posing as sisters dressed in woolen clothing. The two walked for three weeks, covering approximately 125 km while exchanging their labour for food and lodging—which was often in a barn. Eventually, Mona Parsons made it to Holland where she told a Dutch farmer that she was Canadian and needed to find some Allied troops. The farmer took her to the North Nova Scotia Highlanders—ironically, a regiment from her home province! The Canadians were shocked when they saw the thin sick woman approach them for help, claiming that after nearly four years in Nazi prisons and camps, she had walked there from Germany following a desperate and dramatic escape! Badly infected blisters on her bare feet were evidence of her three-week walk, and the soldiers were amazed when she told them she was a Canadian—Mona Parsons from Nova Scotia. Parsons never wore a military uniform, but she was willing to lay her life on the line for freedom. 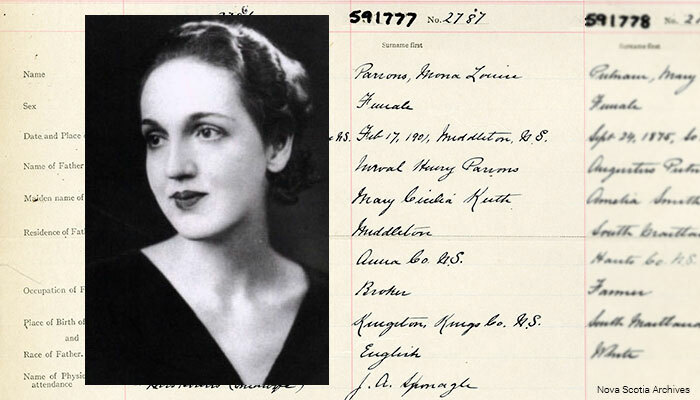 From a Nova Scotian childhood, a Depression-era nurse, an underground worker in the resistance, a prisoner of the Nazis, and an emaciated fugitive who walked across Germany in the last months of the Second World War, Mona Parsons was a true hero. She became the only Canadian female civilian to be imprisoned by the Nazis, and one of the first—and few—women to be tried by a Nazi military tribunal in Holland. Parsons was honoured for her bravery in helping Allied airmen evade capture and received commendations from the British Air Marshall and the United States President Dwight D. Eisenhower. After the war, Parsons would eventually become a widow and returned to Nova Scotia. She later married her childhood friend Major-General Harry Foster who had been a Canadian division commander in Italy and Northwest Europe during the war. Parsons passed away in 1976. This resource page includes links to archival and museum materials for classroom use in discussing her story, and the larger questions around Resistance to Nazi occupation in the Second World War.